A monumental six years have passed since the release of 2009’s No More Stories Are Told Today, I’m Sorry They Washed Away // No More Stories, The World Is Grey, I’m Tired, Let’s Wash Away and the enigmatic Danish band Mew have finally returned with their sixth full-length studio album which they have simply titled “+ −” (plus minus). It is a world of stark contrasts, positives and negatives, of polar opposites: short songs + epic prog/post-rock anthems, optimism + pessimism, simplicity + complexity. Newly independent from their previous label, Sony, the band have re-coalesced into their original lineup, and the four childhood friends have created what they aptly call their most versatile record yet. Less a nebulous cloud of ideas, more focused and driven than the last (but equally taxing to music cataloging software), “+ −” presents a sound that is more accessible to a wider audience. Gone are the frequently-changing time signatures and meandering twists and turns that defined previous albums. The level of effort required of both the musician and listener has been lowered dramatically. Instead, they have incorporated elements of a variety of different influences such as R&B, afrobeat, post-rock, and classic 80s pop and packaged them in a wrapper that is more mature and easier to digest, but still unmistakably Mew. Never wanting to simply recreate what they’ve already done, they push hard in the opposite direction to birth something entirely different. In the midst of a catchy sea of delectable indie pop, one can still find Mew’s signature lush, multi-layered, soaring synths behind funky, insistent guitars, driving bass, and astonishingly inventive beats. Jonas Bjerre’s ever-present angelic falsetto caresses each note with his inexplicable ability to break one’s heart and mend it again within the same measure. Lyrics are both unambiguous and filtered through gossamer layers of metaphor and intentionally vague symbolism. Mew enjoy telling stories of their own lives without proffering specific details, in order for the listener to project their own meaning upon them. Although the album contains four tracks all less than five minutes, one epic, sprawling prog/post rock track will keep fans enthralled for nearly eleven minutes, accounting for a fifth of the length of the entire album. Every listener will be able to find something that speaks to them immediately, and after many repetitions, the songs that originally seemed inscrutable will become comfortable and familiar. Mew are masters at creating music that takes time to take root in one’s psyche, but once that seed is sown there is little chance of dislodging it. “+ −” shifts dramatically from one track to the next, and occasionally several times within the same song, but rather than feeling disjointed, the songs generally feel connected at their roots, with a more optimistic outlook than previous albums. No doubt this is a reflection of the many life events that have taken place over the long period of time since the release of No More Stories…. Six years is indeed a long time for any band to go between releases. Sundry reasons have been offered for this; a grueling tour schedule inevitably left them feeling burnout, and as they began hitting their mid-30s they wanted to spend more time with their families and pursuing individual interests. Singer Jonas Bjerre spent his time creating a soundtrack for the Danish independent film Skyscraper and working with his musical side project Apparatjik. Guitarist Bo Madsen devoted himself to filmmaking, while drummer Silas Graae worked on his visual art. At this time, bassist Johan Wohlert was still writing and touring with his wife Pernille Rosendahl as part of their band The Storm (which they had formed together after Johan left Mew in 2006 to spend more time with her and their newborn son.) Jonas, Bo, and Silas still met often to explore ideas, and even recorded many of them. When it came time to begin working with a producer, they enlisted the services of Michael Beinhorn, with whom they had previously worked on their masterpiece concept album, 2005’s And the Glass Handed Kites. Rather than traveling to America for the recording process, Beinhorn relocated to Copenhagen for a year to assist the band. Given that all the band members now had families and responsibilities in their hometown, it was beneficial for them to be able to work a solid day, then go home afterward. As things progressed, both the band and producer began to feel like something was missing. They were again writing without a bassist, as they had with No More Stories…, and the material was becoming the same type of free-floating idea cloud they had seen on that album. Beinhorn suggested they ask Johan to join in the writing sessions, to see if he could bring a bit more direction to the process. All of them had remained friends during this time, and they had missed playing together, so it was a natural decision to bring him back on board. The Storm was on indefinite hiatus and Johan was in a different place in his life than he’d been when he first left the band, so the timing made sense. It seemed less like years had passed since his departure, and more like mere months. Upon his return, things began to gel in just the right way. 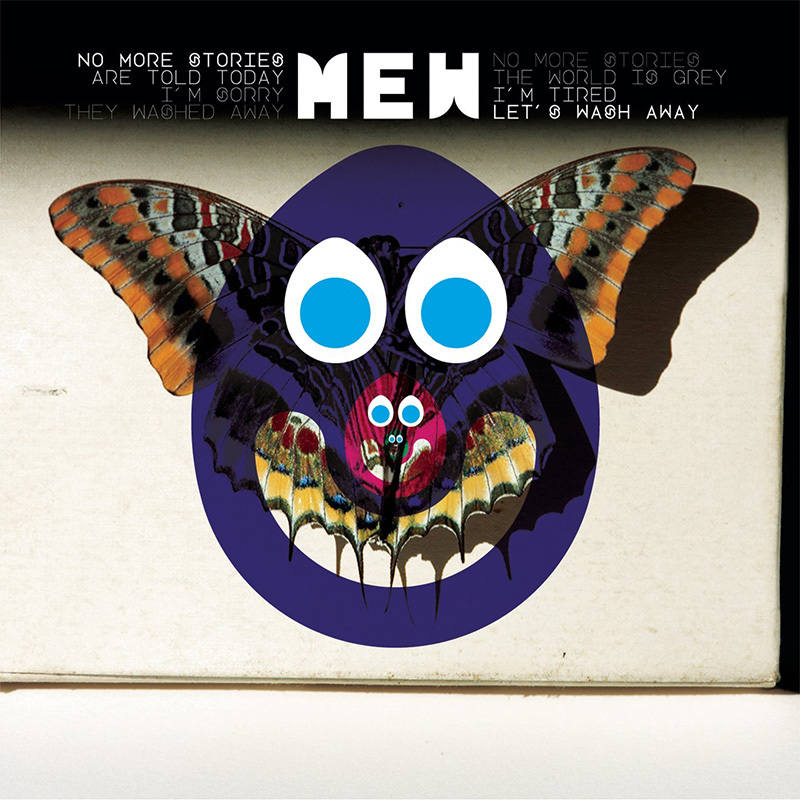 Mew have often drawn criticism for their “intentionally ugly” album covers. And the Glass Handed Kites has been featured on many “Worst Album Covers of All Time” lists. Like the more complex of their songs, upon first view, one might wonder, “What were they thinking? This doesn’t work! It’s nothing but a huge mess!” They have partnered with French design firm M/M Paris, who are most famous for working on visual design for Björk amongst hundreds of other high-profile clients. 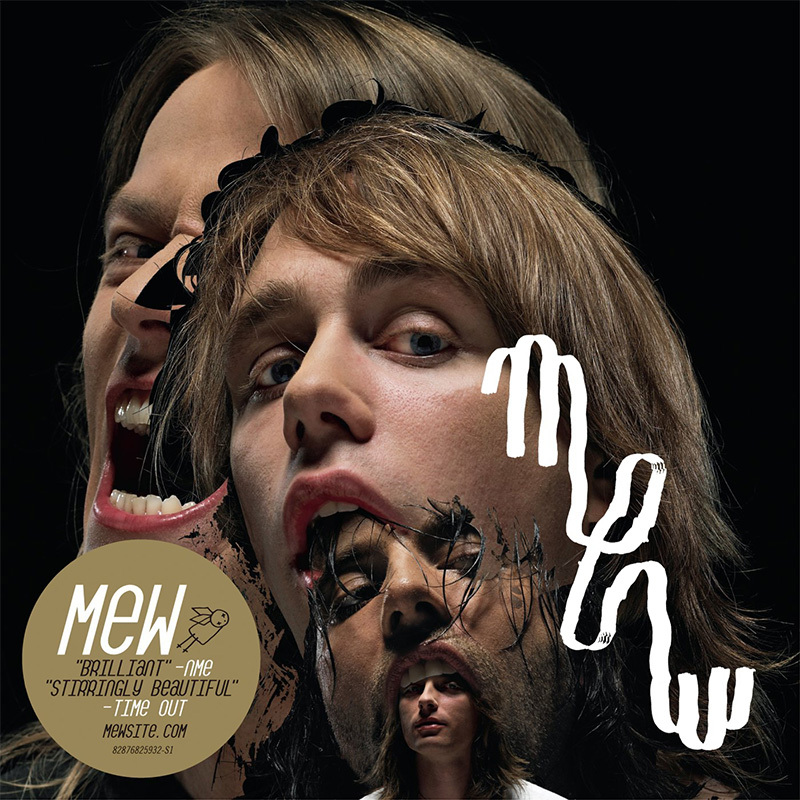 Michael Amzalag and Mathias Augustyniak, the masterminds behind M/M Paris, are responsible for Mew’s previous two controversial album covers, and once again the first impressions of “+ −” are similar. They provoke a response, and the image sticks with the viewer. That’s the entire point. It is a deliberate, controlled chaos. 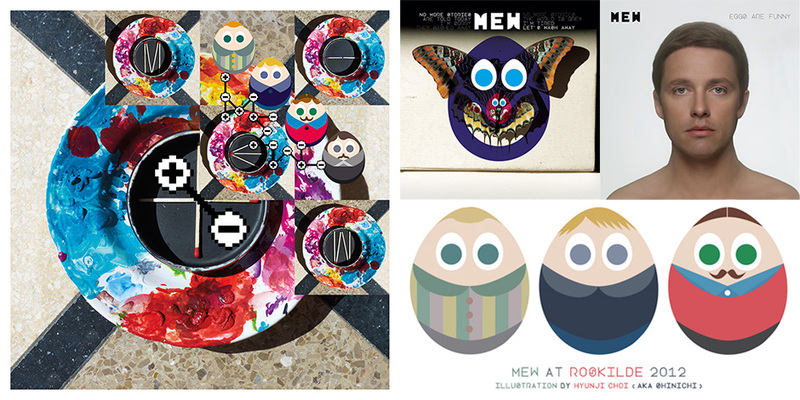 The vector egg portraits of the band members are a direct reflection of Mew’s true appreciation of their fanbase. 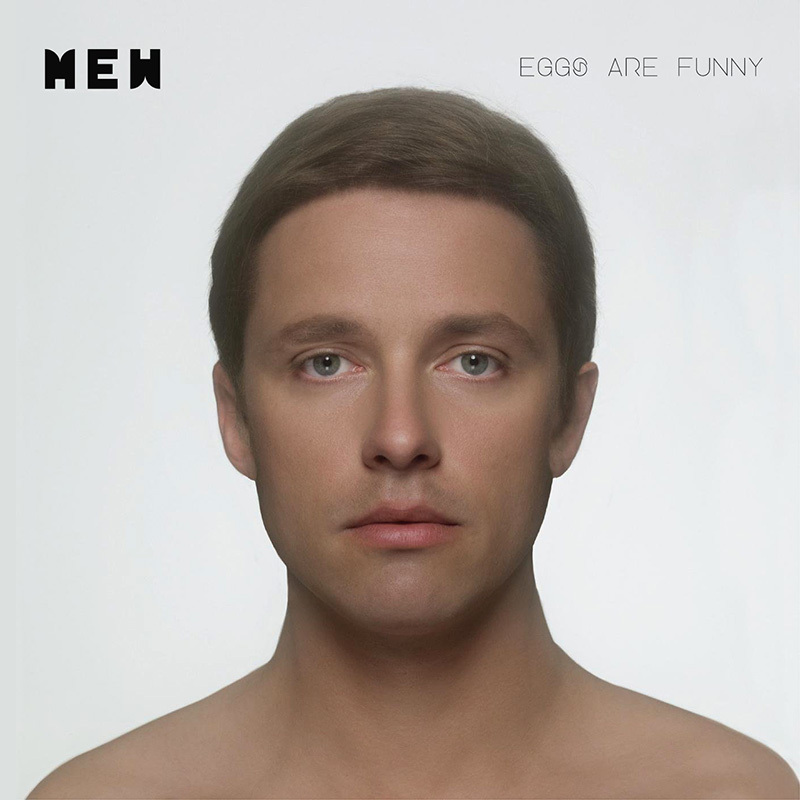 Originally created by fan Hyunji Choi (a frequent contributor to this website), they were a recursive adaptation of shapes from Mew’s cover of No More Stories… mixed with the title of their 2010 compilation album Eggs Are Funny. Mew are dressed in the clothes they wore at their appearance at Roskilde Festival 2012 (with the exception of Johan, who was added to the drawing later on.) Mew liked the drawing so much they asked permission to use it in their promotional materials, and it became so iconic they decided they also wanted to feature it on the new album cover. It is quite a lovely display of mutual inspiration! Enough History Already, Tell Us About the Music! Since each song on “+ −” has its own unique characteristics and there isn’t much in the way of a common thread musically or thematically compared to earlier Mew releases, it makes the most sense to delve into each track individually. The opening track, Satellites, has been around the longest, as it has been out there in some form for nearly three years at this point. When it first debuted as Klassen (The Class) at a private show in Copenhagen on the evening before their appearance at Roskilde Festival in 2012, it was quite clearly a work-in-progress; there was little variety to the verses and it was quite rough around the edges. It was fun to listen to it grow and develop over these years, choruses coming and going, main vocals becoming backing vocals, guitar and drum parts gaining vigor and confidence as the song became more polished. As such, once the final version became available as a single, it was difficult to hear it as a finished product. After all, three years is a very long time to get to know a song while only hearing it in an incomplete form. The mood is generally upbeat and hopeful, incorporating twinkling harps and sparkling keyboards. The lyrics speak of celestial bodies both in the form of objects orbiting other objects and figurative aspiration of sunlight. The colorful, dramatic lights used in the music video are a preview of what we can expect to see when their new stage show is ready to go. The big surprise in Witness is not in its length (it is the shortest track, at just over three minutes) but that Jonas uses a lot more of his chest voice than is typical. One might be taken aback to find that he has a lovely tenor register in addition to his oft-used falsetto. Mew started playing this song live in the summer of 2014 and admittedly I wasn’t exactly sold on it in the early days. The driving, aggressive guitar and forceful drumming were overpowering and it seemed to lack the sensitivity that many of their best songs possess. It wasn’t until Mew played a stripped-back acoustic version of this song during their early promotion of the record that its beauty was made clear to me. The soul of this song lies in the lyrics and melody, which are heartbreaking and tragic, and better suited to ballad form than rock song. The mix on the studio recording is far more balanced than the way it is played live, so the beauty is able to shine through. Instead of being something I wasn’t expecting to like, Witness has become one of my favorite tracks on the album. Mew has made a habit of featuring a guest vocalist on their studio albums, and this time they have taken it further than ever before. The Night Believer is a duet of sorts, featuring New Zealand pop superstar Kimbra, who gained massive success after being featured on Gotye’s 2011 hit Somebody That I Used to Know. Kimbra worked with producer Rich Costey on her album The Golden Echo, which was released earlier this year. (Costey is well-known to Mew as he produced their albums Frengers and No More Stories… and mixed most of “+ −”) Kimbra asked Jonas to provide backing vocals for one of the bonus tracks on the deluxe version of the album, a song called The Magic Hour. Naturally, the deal was reciprocal, so Kimbra features on not one but three of the tracks on “+ −”. The Night Believer itself is one of the most straightforward, regular songs Mew has ever written. There are very few surprises in store here, although I am amazed to find the song still goes through my head occasionally despite its simplicity. It feels at home in the company of other uncomplicated pop songs like Symmetry, Beach, and Mica. The final version of Making Friends is not dramatically different than the version that was released as a promotional single in 2013. Some background noises have been added (people talking, children laughing and playing outside, as well as a couple shouts from the backing vocalist) and one bridge is instrumental instead of lyrical (although the lyrics show up again later in the song) but it is basically the same tune we already know and love. Beautifully pulsing synths, metronomic clicking, and funky guitars that call to mind the riffs from Introducing Palace Players beneath soaring vocals make this song perfect for summertime. Lyrically the narrator appears to be at a crossroads with a life that involves him settling down in a new place, in a situation different than the one he has been accustomed to. Initial skepticism makes way for cautious optimism as he finds his way in his new lifestyle. Arguably, Clinging To A Bad Dream may be the most Mew-like song on the album as the song starts in one very unusual place and meanders through different passages and tempos until it ends up somewhere else light years away from its origin, almost as if tracking the various stages of someone’s actual dream. Aptly, the working title for this song was Changes although the last section had also been referred to as Koor, a made-up word inspired by the Danish word for “choir” (kor). In May 2013 the Icelandic vocal group LYRIKA (which consists of members from Björk’s backing choir Graduale Nobili) performed the last five lines of this song for the Ja Ja Ja Festival launch party at London’s Roundhouse Theatre, as part of an a capella mashup with The Zookeeper’s Boy. Eventually Mew began performing a live medley with these two songs, adding a section of The Seething Rain Weeps for You. 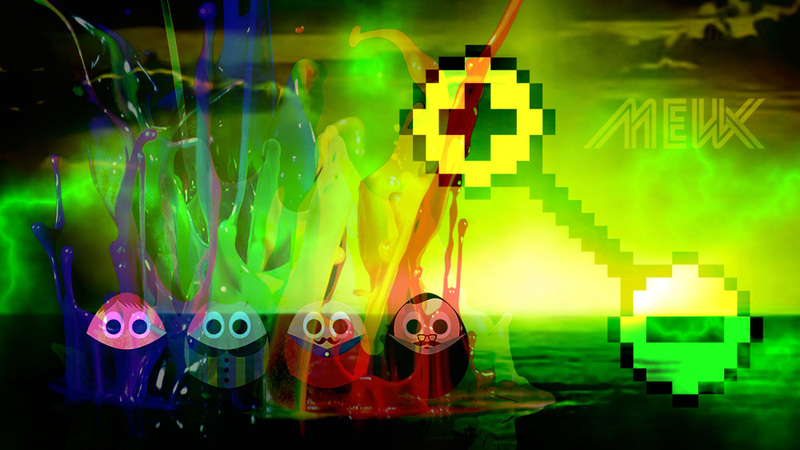 Through the many twists and turns in this song we begin with a jungle beat, unlike anything we’ve ever heard from Mew. Drummer Silas Graae has said in the past that he spends a lot of time listening to afrobeat, and the influence is fairly obvious here. Verses build upon each other, lyrics which are sung muffled and echoey sound anxious but reassuring, but eventually slip into a haunting, Lynchian nightmare world. One could easily imagine Jonas on stage in front of a blood-red curtain, crooning into an audience filled with mystifyingly serene bikers, occasionally interrupted by a giant or midget with a message for Agent Cooper. Even the title itself is quite Lynchian. Mew met guitarist Russell Lissack while touring in support of Bloc Party in the summer of 2006. After developing a kinship, they decided they would love to collaborate on something someday. My Complications is the result of part of that joint effort. Fans of Bloc Party will immediately recognize Lissack’s signature manic playing style in the riffs that comprise much of the track. Even with the guitar part screaming “Bloc Party” (and the working title for the song being called “Russle”), this song is classic Mew. Lyrics describe a confusing, troubled relationship with thinly-veiled references to a partner’s possible drug use and unhealthy lifestyle. (As a side note, it seems interesting that they have used the name “Mary” in another song that refers to aspects of health and sickness, as their song Vaccine from No More Stories… spoke of a “Maria” in similar terms.) The ending refrain, repeated multitudes of times, loses its impact ever-so-slightly in the studio recording when compared to the live version, which is presented simply with four voices blending over the top of keys, devoid of drum and guitar, calling to mind the 4-part, voice-only ending of The Zookeeper’s Boy. Mew have done an amazing job playing with aquatic metaphors on Water Slides. Throughout most of the track we can hear a pulsing, almost radar-like synth sound, and verses bleed into choruses with the help of backing vocals that sound categorically like a cetacean choir. The flow of the track feels almost like being underwater, and the radio edit that was released just prior to the single sounds very much like it was recorded in the briny depths. Thematically, Water Slides shares many of the same characteristics as My Complications. Another description of an unstable relationship troubled by health issues, although whether it has to do with drugs or a mental break (or something else entirely) is deliberately unclear. Where My Complications is a bit more upbeat and optimistic, Water Slides is nightmarish and terrifying. Something absolutely tragic has happened, and the narrator is telling his tale with pain and regret. This song is dark. Again, Kimbra provides backing vocals, impeccably complementing Jonas’s plaintive and searching cries. Musically, this is one of the more straightforward tracks, with much repetition and regularity, until we reach a sound-bending bridge that throws a wrench in its predictability. It sounds otherworldly and wrong at first, but it is a key component of the metaphor in this song where the narrator is trying to make sense of something horrible, and can’t quite do it. The deadpan “Ha ha ha ha ha ha ha” is just chilling. The music video for Water Slides is an artistic interpretation of the song’s mood, a slow-motion art film by Danish filmmaker Anders Malmberg. The song has also already been remixed by UK electronic trio NO CEREMONY/// and 808 State’s Graham Massey. Interview the Girls brings back the sunny feeling introduced earlier by Making Friends. Although the lyrics speak to uncertainty and doubt, the mood is upbeat and cheerful: birds are chirping in the background, conjuring up images of being outside on a summery day. It feels very much like some of the songs Jonas wrote for the Skyscraper soundtrack. The song builds in intensity as the chorus repeats “Give your cruel ride to someone.” Percussion is quite subtle throughout the song, and vocal parts are sung in rounds, each time building on the previous iteration, much like The Zookeeper’s Boy. As is often the case with Mew, there is a bit of cognitive dissonance between the lyrics and the mood of the music, but it’s the sort that only appears once considerable thought is given to each. Listen carefully, and one can once again hear Kimbra in the backing vocals. By this point in the album, a listener could possibly believe they had just purchased a slightly offbeat pop album, but that perception is about to be turned on its head. Anthemic, epic, sweeping, orchestral, symphonic: all the usual adjectives for post-rock are appropriate for this prog-inspired masterpiece. The simple lyrics fit nicely atop the absolutely enormous soundscape presented by Rows. No doubt this song is in league with Comforting Sounds and Cartoons and Macramé Wounds as the most colossal-sounding Mew tracks to date. If any song could oust Comforting Sounds as a closing sound for a live concert, this is it. Even if Mew are able to figure out a good arrangement for playing this track live, the level of effort to play it properly seems monumental. As with many prog and post-rock songs, Rows takes us on an instrumental journey through different movements, with soaring, lushly layered sections bringing to mind the great artists in these genres: Explosions in the Sky, Sigur Rós, M83, and even Beach House. Drums drop out for a large portion of the middle of the song, leaving room for these soaring, melancholy chords to take hold, only to return in an almost jungle-like beat complete with insistent, anxious tribal chanting. Unusual instruments have been chosen to create such a sound throughout: timpani, marimba, and vibraphone. Lyrically, over and over we hear the narrator telling his love that he will be with her “almost all the way” and suggesting that he might do things without her because he feels lost without her. (This seems to defy logic, but when are emotions and motives ever straightforward?) These passages are intermingled with verses that sound quite like nursery rhymes, with very short lines and simple, almost child-like rhyming patterns. Given the length of this song there are surprisingly few lyrics, and most of them are repeated many times. This song is well-worth the time commitment required by its nearly eleven-minute runtime, but one should carve out at least a half hour to play it a few times in a row. This behemoth cannot be absorbed in a single listen. This song perfectly encapsulates the maturity and wisdom gained only through age and experience. Previous Mew songs have had lyrics that openly questioned relationship decisions or put the blame on the other person, but Cross the River On Your Own turns that around. The narrator is taking responsibility for his own part in a failed relationship, demonstrating that although things didn’t work out, things can still be okay between both parties. The lone guitar and keys in the beginning calls to mind the very stark, simple intro to Comforting Sounds, and the general feeling of the song is very similar to that of Louise Louisa. The track ends with an almost cricket-like sustained chirping note, as though nature has taken over. Nick Watts, Mew’s touring keyboardist since 2002, was involved in the writing of this track. Having played on many of their studio albums over time, this is his very first writing credit. The piano parts have a much more jazz-inspired feel to them than those typically written by Jonas. Should this song achieve longevity in the collective Mew psyche, perhaps it could lead to further collaborations in the future. Mew are back after a very long break, more invigorated, pop-centric, and relevant than ever before. “+ −” is indeed a delight to behold, and is certain to be on heavy rotation for years to come. If Mew were to gain any sort of much-deserved international attention for their work, it seems like “+ −” could be the tipping point for them.